Welcome to Gullsbottom Harbour! You are an ambitious entrepreneur looking to buy the most valuable buildings in the Harbour. You’ll do this by gathering goods and selling them on the open market, but beware–your opponents are also trading on the open market and when they sell their goods it affects the price you’re going to get, so be wary–the price on that fortune of fish you are looking to sell may go belly up at any moment! Harbour, from Tasty Minstrel Games, is worker placement and resource management game with a dynamic commodities market mechanic. 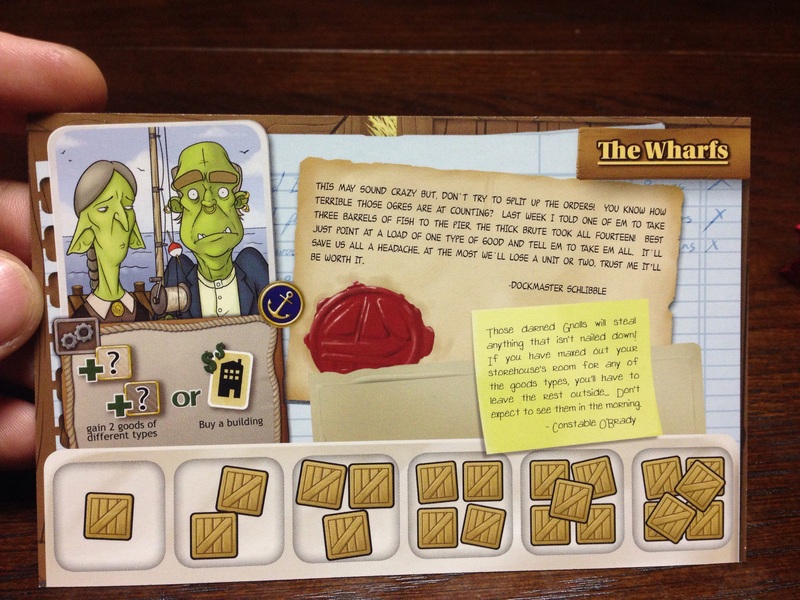 Each turn players place their worker at an empty building and perform the actions described there; these actions can be to gain goods, exchange goods for other kinds of goods, sell their goods to buy buildings, or take other special actions. On their turn players must always move their workers from where they are to a different building and may not place their worker on any building currently occupied by another player’s worker. If a player places their worker in a building owned by another player, they pay that player a toll of one good of their choice. Each different building allows a player to perform various actions to gain and exchange goods or buy buildings. 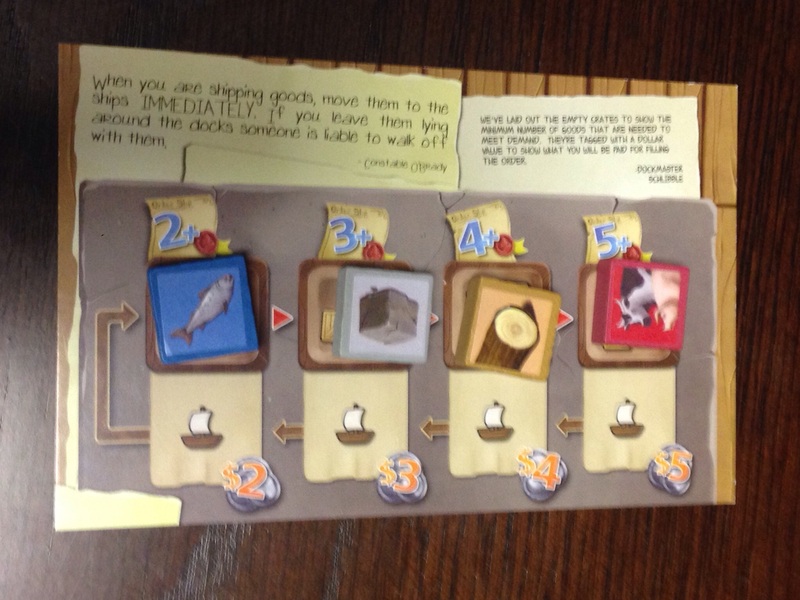 The goods available to the players are wood, stone, fish, and livestock. The various building abilities allow players to gradually build up their supplies of the goods by gaining certain goods or exchanging goods they already have for others; for example, the butcher allows a player to exchange one livestock for one of each other kind of good. Once players are stocked up they sell their goods on the open market to buy buildings. The price a player can sell their goods for depends upon the demand in the market. To sell goods, a player must first meet the requirements to ship those goods; for example, in the picture below livestock is on the 5 space of the market, so it requires a player to have at least 5 livestock in their supply to sell it and they receive $5 when they do. Generally a player will be selling two or more kinds of goods. When a player sells goods, they reduce their supply of that good to zero (all of a players supply of that good must be sold even if less is required to sell that good) and then move the market token for that good downward on the market board. Once all goods have been sold, the market adjusts to reflect the shift in supply and demand in the market; the tokens of all of the goods which the player did not sell shift to the right on the market board as far as they can go with one tile in each space and no empty spaces in between, then from left to right the tokens for the goods the player did ship are moved back up into the market in the same manner. Functionally this means that when a player sells goods, whatever they sold for the most money becomes the commodity that is worth the least. Players must try to manage their supplies of goods so they don’t suddenly find themselves in possession of five of a good which now only sells for $2 (remember: when a player sells a good they sell ALL of that good they have in their supply regardless of how many are required to sell that good or how much they can sell it for). 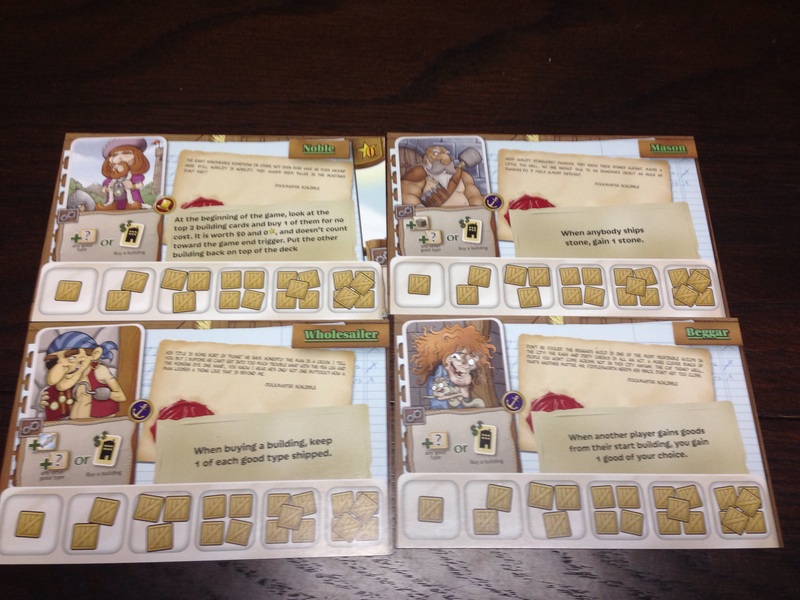 When a player sells their goods it’s not just to make money to go out for a nice seafood dinner or to buy an awesome new board game which they read a review of written by a dashing young tabletop gamer. You are an entrepreneur and such frivolities can wait! 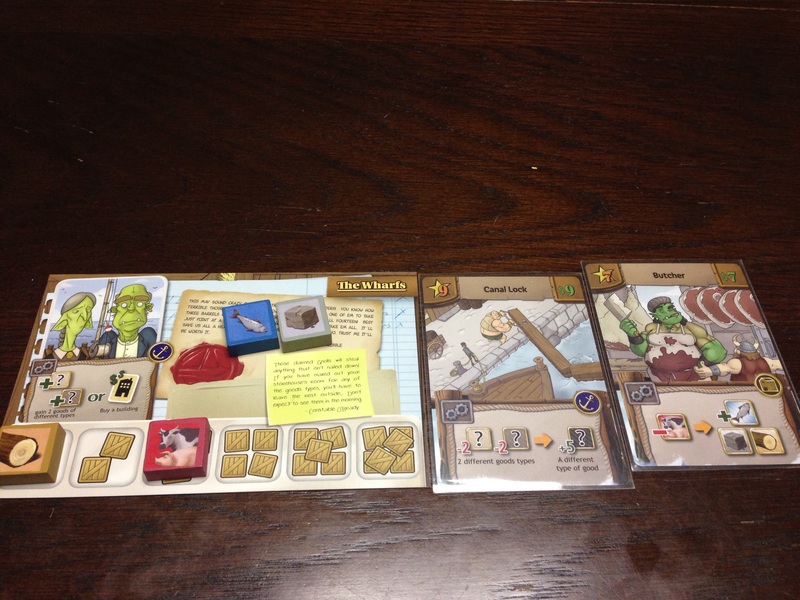 The money a player makes when they sell goods is immediately used to buy buildings in the harbour. These buildings move from the public pool of buildings into their personal holdings and is replaced with a new building from the deck; all money in excess of the purchase price of the building is lost (sorry, no banking that cash). Other players may still use the abilities of that building, but they must now pay its owner a toll of one good in order to use it; more importantly, buildings are worth victory points at the end of the game according to the number of stars they have in their upper left hand corner. Buildings may also have various icons on them that bestow special powers to their owners, such as making other buildings cost less to buy, allowing them to retain some goods in their supply when they sell them, allowing them to gain or exchange more goods when they use a building’s ability, or even allow them to use another player’s buildings without paying a toll! When a player buys their fourth building, it triggers the endgame and each other player gets to play one more turn, then players total the victory points on their buildings and the player with the highest total wins! 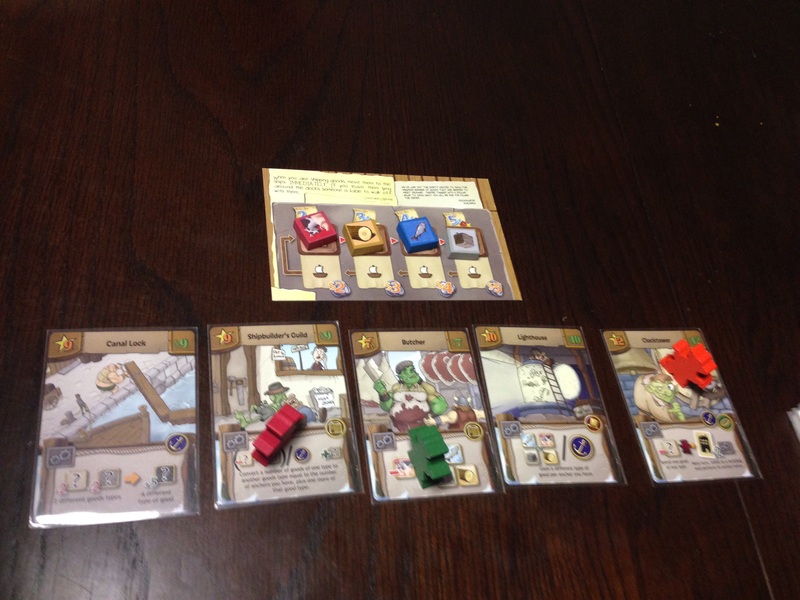 Harbour can be played with the basic rules where all players have the same starting “home” building and no special character abilities or the advanced rules where each player is dealt two special characters and they select which one they would like to play for that game. These special characters each have their own special ability and starting “home” building; while I only had the chance to play Harbour with the basic character cards (which is how I recommend you play your first game to get hang of the game mechanics), I did get a chance to look through the special characters and I can see how they add some extra depth and strategy to the game without messing up the core mechanics of the game. Above are pictures of the basic player card and some of the advanced player cards. When I first started playing this game I can honestly say I was not a big fan of it. I didn’t understand the various ways to gain and exchange goods to then be able to afford to buy buildings. After a few turns I started to get the hang of more effective ways to multiply your goods, block your opponents, and play the market more effectively and I ended up really enjoying playing this game. The market adjustment mechanic is a really neat twist that had me trying to predict when and what my opponents would be selling and trying to plan out the best way to accomplish my goals three turns down the road. The cards all have really great illustrations and fun flavor text; the components are well crafted–quality, well printed cards and cardboard player boards and quality wooden commodity and worker tokens. Harbour plays two to four players and is recommended for ages 8 and up. 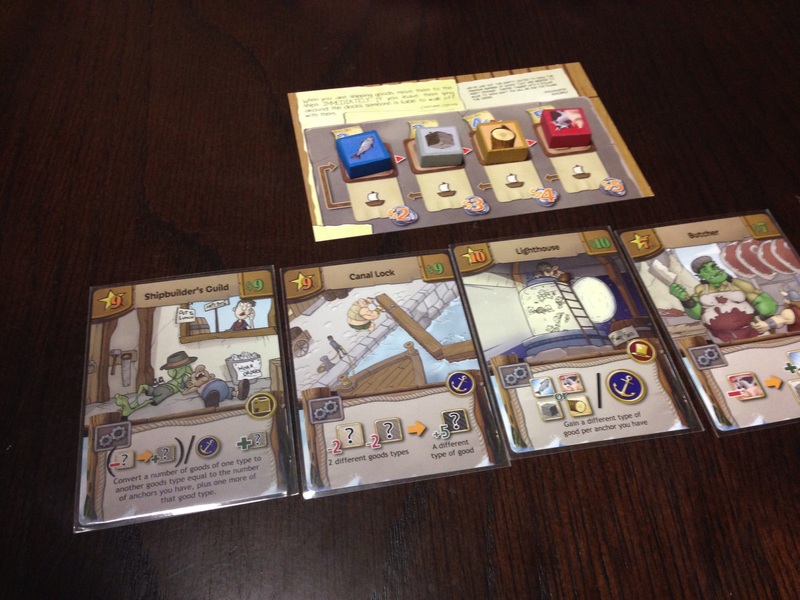 Harbour comes to us from Tasty Minstrel Games and was successfully funded on Kickstarter back in July. While they do not currently have a webstore on their site, Harbour appears to already be available through Amazon and your friendly local game store. I tried this game out using a copy from a friend who back it on Kickstarter, but I do hope to have my own copy soon (my birthday is coming up in April, just an FYI). I give Harbour 4 out of 5 stars. Hobby Tutorial: How to Make a (nearly) Free Photo Studio for Your Painted Miniatures!